Today’s episode is brought to you by the Everyday Einstein podcast. Russia Investigation: The House Intelligence Committee is re-opening an investigation into Russia’s interference in the 2016 election. They’ll be looking at President Trump’s finances to see if there are any foreign ties. This is separate from the special counsel’s ongoing Russia investigation. Lawmakers have also voted to send Special Counsel Robert Mueller more than 50 witness transcripts to see if anyone lied under oath. Virginia’s Political Chaos: Virginia Attorney General Mark Herring admitted to painting his face in 1980 when he was in college. He apologized and said it was a one-time thing. It’s the second apology about this to come from a Virginia politician this week: Governor Ralph Northam also apologized after he admitted to painting his face black in the 80s. And there's more. A third elected official in Virginia is also dealing with controversy. Lieutenant Governor Justin Fairfax was accused of sexually assaulting a woman 15 years ago. He says he didn’t do it. If all three men were to resign, Republican House Speaker Kirk Cox would step in. For now, Gov. Northam says he won't step down..
Trump’s World Bank Pick: President Trump has nominated Treasury Department official David Malpass to head the World Bank, even though Malpass is known for criticizing the way the bank operates. If he gets the job, Malpass would replace Jim Yong Kim, who announced his resignation in January. Malpass still needs to be approved by the countries that control the bank. Climate Change Report: A new report shows 2018 was the fourth hottest year on record. According to NASA, the Earth’s temperature during 2018 was almost two degrees above average, making it one of the hottest in 140 years. The report shows the last five years have been the warmest in recorded history, and 2019 is expected to be the second warmest year. Tipping Controversy: Grocery delivery app Instacart is changing its tipping policy and apologizing to delivery workers. Workers and customers posted screenshots of receipts online, which showed the company seemed to be cheating workers out of tip and wage money. The company denied it before giving in. Other gig economy companies like DoorDash have been accused of similar withholdings. Spotify Buys Podcast Companies: Spotify – which is the world’s biggest music streaming company – is now trying to make an even bigger name for itself in the realm of podcasts. Spotify paid more than $200 million for podcast network Gimlet, which is known for popular podcasts like Reply All and StartUp. Spotify also purchased Anchor, an app that helps users to create podcasts. The company plans to spend an additional $500 million on other deals this year. Samsung Rumors: A leaked picture may be a sneak peak at Samsung’s new ear buds. The Verge reports the photo shows wireless earbuds sitting on the back of the new Galaxy S10 phone. Some people think the phone may be able to charge the wireless headphones, but it's not confirmed. Samsung is set to reveal the new phone later this month. Grammy Updates: Ariana Grande has decided not to perform at – or attend – the Grammys following a disagreement with producers on what songs she could perform. Grande says she felt insulted when they wouldn’t let her perform her new single 7 Rings. More artists have been added to the line-up: Lady Gaga, Mark Ronson and Travis Scott will appear. The Grammys are this Sunday, February 10 at 8 p.m. EST on CBS. 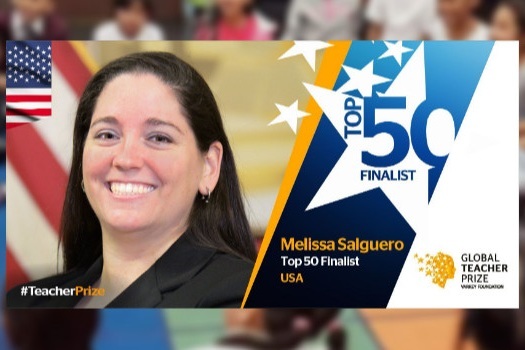 Melissa Salguero is the 2018 GRAMMY Music Educator Award Recipient and is a top 50 FINALIST for the 2019 Global Teacher Prize, which awards the winner with $1 million. Salguero says she’s an educator in order to inspire generations of students and teachers to work hard, dream big, and never give up on their goals in life. Her mission is to provide students with a diverse music education that fosters musicianship, leadership skills, and a sense of community that unites them together. You can learn more about her in this CBS News feature.